The whole world is running at the same time. Across 6 continents, whatever the weather. Across coastlines and through cities. Running at an event or using the app. Until the catcher car catches every last person. All for one great cause: spinal cord injury research; running until we find a cure for spinal cord injury. The world’s largest running event starts now. Or at least that’s what it says on their Hollywood-esque international broadcast, beamed out to hundreds of thousands every year online and at the event at Wings For Life. Click here to watch the 2018 video. Otherwise, my jokes won’t make sense. The altruistic goals, the flashy live videos, unique opportunity to be chased down by a Subaru… It was too good to miss. Some history: In 2016 I attempted to register. I saw when registration would open, then on the following day clicked the link to see that it was now full. I brooded over the live stream waving my arms emphatically when they would cut to Taiwan where teenagers stood sentry in front of the cameras on course, flashing peace signs and duck faces. I’ll note that Taiwan was the only country in the world that completely sold out registration: some of which covered 1 and 2k before the catcher car got them presumably because taking selfies is a very preoccupying task. These are the people who outbid me for bibs?! The following year in 2017, shoved my work secretary off her chair so I could register the moment it opened. I got in and ran in Tainan. You can read about my experience here but the short version is: I got knocked out by steamy hot weather and no electrolytes to be had, resulting in paranoia, visions, and nasty illness. You won’t beat me again, Wings For Life. I got registered for an email list that allowed me access to the signup page before it went public. Me and Summer frantically got our names down, and once again the race sold out (and once again was the only place in the world that sold out, and once again was one of the slowest countries in the world) this time filling its registration allotment of 10k within a few hours, mostly due to the server crashing. But despite 10k paid and registered less than 5k crossed the finish line. Why is that? Well, due to the high demand, comprehensive ID verification and forms are required to pick up your bib this year. This is to deter any sort of black market of bib buying and selling; something common at Taipei Marathon (looking at you Chris, who ran last year in a woman’s bib.) A respectable cause with horrible execution. Summer and I walked up to registration after a leisurely stroll to take photos with the car and checking out the venue. Confident that 3 hours was enough time to get our bibs and get a little food before the race, we were shocked to see volunteers directing us to the line start a block away from the pickup area. This line stretched two blocks south, turned and came back 2 blocks north again. We stood, legs aching, in the sun without dinner for a total of over two and a half hours. When we finally escaped the screaming mass at bib pickup, we saw we had 20 minutes before the start, the race venue was still many blocks away down on the other side of the city, and we still needed to check in our bag. So I pinned my bib to my shirt while walking down the sidewalk, hauling our gear back to the start line while mobs of people rushed around us. Turning back, I saw hundreds of people still standing in line, and now volunteers were telling those too far back that they will not be able to race this year. With a handful of minutes until the start, I shoved (literally) through mobs of people to the 1st starting group. To those runners who refused to let me through up front, I gave an internationally-recognized tap-tap, stink eye and pointed at the number on their bibs, indicating that they should be in the 3rd or 4th starting group, but the translation was lost, and I was squished between bodies, already beading with sweat. The weather was cooling down (it peaked at 33 earlier) but the humidity lingered, and anyone on their feet for too long started to condensate like a foggy window. Someone nearby yelled my name, asked if I’m Cory from Beast Runners and I said yes. He told me he’s going for 50k this year and I wished him luck. My goal this year is a marathon, and then start a sprint if there’s anything left in my legs and the car didn’t catch me yet. Last year, I was doing the death march when the car passed me at 35k. Ahead I saw Chou Ching, the local star, and pinned him to be the overall winner today, and watched him wade into the mob of sponsored athletes, alongside fellow Solomon runner, Cliff. The DJ proudly announced that there are an abundance of foreigners up front, all ready to win. I was squished next to someone with a Chinese flag painted on his chubby face and resisted the urge to ask him if Taiwan was part of China. With the drone zooming overhead, and feverish overweight runners still pushing around me to get into their precious start line photos, the gun went off. And so did my Garmin. I flashed back to this morning when I plugged it in and it told me there would be an update, would I like to update now? Yes, please. Now across my wrist was the crescent moon shape of a loading bar and the words “installing…” But I knew better than to look down, as The Running Of The Asians commenced, and bodies flurried around me, trying to be visible in as many camera lenses as possible, sometimes knocking me in a fashion that would make NHL scouts nod in approval. The mob thinned after a few hundred meters and I started into a steady rhythm, noticing we were doing some serious downhill. I let my long marionette legs take over and rolled downhill at a pace that felt far too fast, despite people zooming by me as if I were standing still. I checked my watch to see that in my “current pace” slot sat an unmoving 6:00 min/k. Either I’m now flying through some kind of warp in the interdimensional space-time continuum or my Garmin is kaput. I’m going with the latter. I piece together the problem has something to do with the update, and click off the “current pace” function on my watch, now displaying just time and distance, while we turn a corner and look up at a hill. I learned the hard way that this 25k loop course is loaded with three climbs, the lowest points at 35m and the highest at 105m. A quick recap of last year flashed through my mind: I came out strong: 4:05-4:10 pace for the first 15k, destroying my legs and heart, and ultimately sweat out every bit of sodium in my body, then tried to revive myself on race-provided Red Bull and bananas, sealing my coffin for the car to catch me while I was walking in shame. At 6k, I let tens of people pass me (maybe more than 50) as I climbed the first hill, feeling the heat rising off my thumping chest. I wasn’t sure my exact pace, but I was certain that it was far off from anything that would get me close to a 50k finish. It was so early and my legs already felt like they were full of sand. I accounted some of this to the fact that I haven’t sat down for over 3 hours and cursed that line and the lack of dinner currently in my stomach. It’s not going to be this hilly the whole time, is it? The race played out like this: I wasn’t an idiot for once, and I ran by feel. I kept my cool by dumping water on myself every aid station, took GU gels at regular intervals, and drank one or two large cups of water every aid station. I thought this volume of water would end with a water balloon-belly sensation but actually proved quite comfortable. Note: drink ridiculous amounts of water when it’s hot. It’s totally okay. My legs cleared up after around 10k and I got into a rolling pace that felt I wouldn’t regret later. It was probably much slower than would allow for my target time, but I was feeling nice. After 18k, the same bodies that zipped by me on the first hill were floundering along the side, gasping for air. Many runners in the same Nike uniform were all slowing down now. I wondered what their coach was going to say. I should mention that this is the only Wings For Life in Asia, which definitely does a lot to the tourist imagery of the race, as well as the registration chaos. I met runners from Japan, China, Hong Kong, Singapore… Basically, if you’re Asian and want to run Wings For Life, you have to come to this one, and many people come from far away because they know they can run the same race they did before, but with different scenery. I noticed the first place woman just ahead of me, from Sweden, and a mob of tiny Asian men surrounding her like flies. How do I know she’s the first place female? They had beaming lights from cameras drilled into the poor woman while scooters zipped back and forth around her spitting fumes in her face. I kept the posse a few seconds ahead of me, watching as one-by-one the flies dropped. I believe I only have two race photos because every photographer was panicked to get her photo as she passed, then turned to celebrate to their friends (one even turned and took a selfie with her) as I ran by. When she shaved the pack down to 2 guys, I felt like the pace was a bit easy and I caught up. I gave her a quick shout saying she’s doing great and keep it up, which she responded with what might have been interpreted as a nod, and we ran somewhat together for the next 5-6k. She was aiming for perfectly flat splits, and I was playing it safer on the hills and letting myself open up downhill, so we spent a while leap-frogging each other. 30k passed to 35k, and I kept rolling in the same fashion. Once I passed 38k, I knew I had beat last year’s distance, and urged myself to hold off the car to the 42.2k mark just to say I completed a full marathon. You’ve run more painful 5ks than this. Push it. Quick math at the 35k mark told me that I probably would not be able to make a full marathon, but my watch was still displaying somewhere around 6-minute pace, so I had no way of knowing. At this point, I didn’t know if I was going to overshoot my goal or get passed by the car at any second. All I knew was that I wanted to be running hard when it did finally come up. Looking similar as 30k earlier, perhaps with better posture. I picked off 2 more runners coming down to 39k and turned to see a twinkle of the flashing blue lights of death from the chaser car down a long stretch behind me. I knew the car moved slowly, and if I can keep up a steady run, I can maybe hold it off for one or two more kilometers, but at this point, the car made its jump to 20 kph and it wasn’t long before the police and camera crew were passing me. One more surge of energy and I ran hard to prolong the inevitable, passing the 40k marker and picking off yet one more runner. I turned to see another coming up from behind, full sprint trying to pass me before the car got us both, but he would get tagged out just a few meters behind me, and I had a few more meters to fight off the front bumper. Pain, chaser cars, and selfies: Everything Wings For Life is about. I had a little fun getting dramatic as the car came closer, shouting “You’ll never take me alive, Subaru,” and ultimately an Anikin Skywalker yell of “NOOO!” when I heard the beep of my chip being registered. The car rolled past me at 3:05, just short of 41k, and I clicked off my lame Garmin. The first place woman held off the car, sprinting at the finish for another 500m ahead of me. The bus followed close behind, picking up runners, and we were all escorted back to the start line. I had a good chance to exchange conversation and high fives with the runners who were around me, including a 19-year-old pro Nike runner from Hong Kong, and last year’s winner, both quite dejected with their performance. We got our finisher pack: a Red Bull (the smell now made me want to gag) and a finisher medal, no food, and the only convenience store nearby was–of course–completely barren. Summer and I loaded into the crowded train back home, hungry. Summer lamented her 8k run and gave her side of the story of the mobs of people in the back of the pack and the inability to move at the beginning. Overall, Wings For Life, I’m not mad; I’m disappointed. I am disappointed in myself for not performing a little better. And I’m disappointed in Redbull Taiwan and Chinese Taipei Road Running Association for taking what is (in other countries) a fun day of running and taking out all the fun parts. Which is why I’m planning on running again next year: just not in Taiwan. 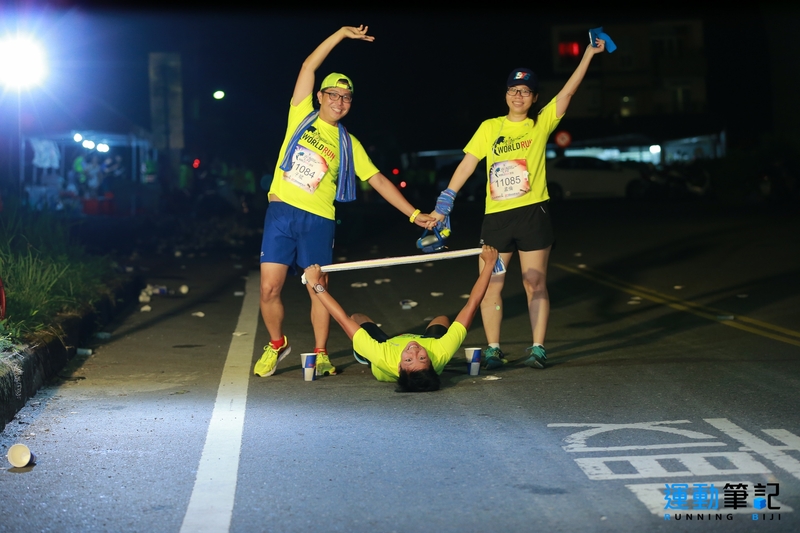 Posted in running, Uncategorized.Tagged marathon, race, taipei, taiwan, travel, wings for life.